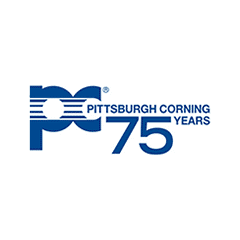 Pittsburgh Corning was founded in 1937 as a joint venture between two prominent glassmakers, the Pittsburgh Plate Glass Company and Corning Glass Works. The company’s primary focus was the manufacture of glass blocks used in commercial, institutional, government and residential structures until 1947, when it began to manufacture FOAMGLAS cellular glass insulation, a product used primarily by the construction industry. It contained no asbestos. Bankruptcy Status: Filed April 16, 2000, confirmed by the U.S. Bankruptcy Court for the Western District of Pennsylvania in May 2013 and reorganized in April 2016. In 1962, Pittsburgh Corning entered into a purchase agreement with UNARCO Industries, Inc., to buy the Unibestos product line, which contained such items as pipe insulation and insulation block. The products in this line were manufactured from Amosite asbestos imported from South Africa. The natural asbestos was partially broken down into fibers at the mines, and then shipped to UNARCO’s plants for further fiberizing and bonding with inorganic binders and fillers. The purchase agreement between the two companies gave Pittsburg Corning all rights to the formula, manufacturing plants, customer lists and exclusive use of the name “Unibestos.” From 1962 to 1972, Pittsburgh Corning manufactured the product, first in a plant in Tyler, Texas, it acquired from UNARCO. In 1964, it expanded production operations to a plant in Port Alleghany, Pennsylvania. From 1964 to 1971, Pittsburg Corning employed industrial hygiene engineering consultant Morton Corn to evaluate the conditions at both plants. Corn found that both plants posed significantly hazardous exposure to asbestos, and he recommended engineering control measures to lessen the risk. However, the majority of his recommendations were not put into effect. In 1972, Pittsburgh Corning ceased production and distribution of the insulation and dismantled and buried the equipment from the Tyler plant. Pittsburgh Corning filed for Chapter 11 bankruptcy protection in 2000. After years of pending appeals, the U.S. Bankruptcy Court for the Western District of Pennsylvania confirmed the plan in May 2013. The Pittsburgh Corning Asbestos Personal Injury Settlement Trust was established as part of a multibillion-dollar settlement of asbestos claims. Funding for the trust began in the first half of 2016. The company emerged from bankruptcy in April 2016 and was acquired by Owens Corning Inc. in May 2017 for $560 million. Exposed to Asbestos at Pittsburgh Corning Corporation? In 1977, 447 former employees of the Tyler plant filed a class-action lawsuit, which later was settled out of court for $20 million. During the trial, Dr. Richard Gaze, the chief scientist for Cape Industries, testified that he consulted with Pittsburg Corning in 1961, prior to the Unibestos purchase, about the manufacturing process and the necessary precautions that had to be implemented to protect plant employees from asbestos exposure. He also testified that he continued to consult with the company about safety procedures over the course of the next ten years. David Simpson worked on a steam piping system using Pittsburgh-Corning’s Unibestos, a thermal insulation pipe containing amosite asbestos fibers. Doctors diagnosed Simpson with mesothelioma, which claimed his life in 1988. His wife Helen received a total of $2.3 million from Pittsburgh-Corning and other asbestos insulation manufacturers. From 1955 to 1968, Robert Dunham worked for the Pittsburgh-Corning Corporation as a chemical operator, using insulation and asbestos-containing materials. Dunham developed lung cancer from asbestos exposure and passed away in 1997. His widow took his case to court in Texas, winning $19.3 million in compensatory and punitive damages. Unibestos was used as pipe insulation in a number of different residential and commercial construction applications, including for use in nuclear reactor compartments on nuclear submarines. The insulation had to be removed and then reinstalled each time repairs were made on components that were covered with it. Handling the insulation this frequently would have caused a significant amount of asbestos fibers to become airborne and be inhaled. The asbestos was shipped from South Africa in gunny sacks that had no warnings about the dangers of asbestos exposure. Plant workers removed the raw asbestos from the sacks with their hands. Although the workers wore respirators, after an hour, the respirators became clogged with asbestos dust.